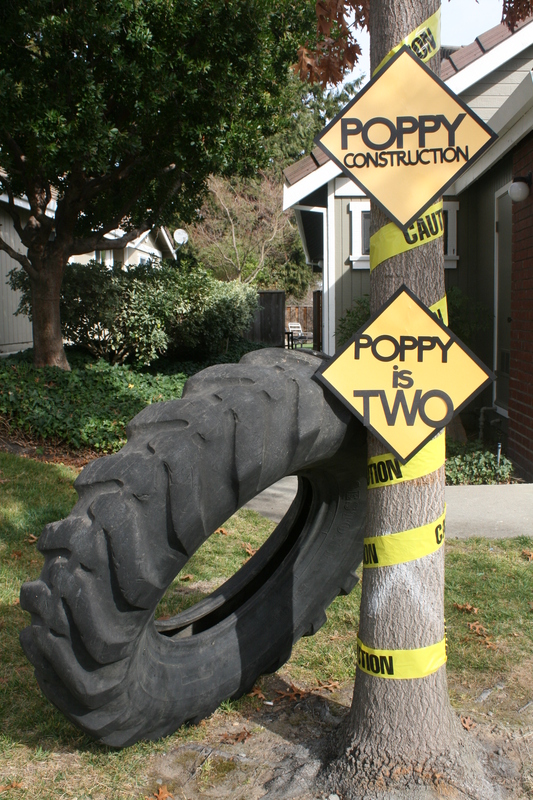 It's still hard for me to believe Poppy turned 2. What's even harder to believe is that her birthday was already 6+ months ago. So not only is she even older, but my word, am I behind on getting this post up. I've just been so busy with the kids and trying to get my house finished up and many other things, like the hubby's 30th birthday party, planning Hudson's 1st Birthday, going back to work - and the list of things that consume most of my productive free-time goes on and on. But regardless of when Poppy's 2nd birthday party was, it was awesome! 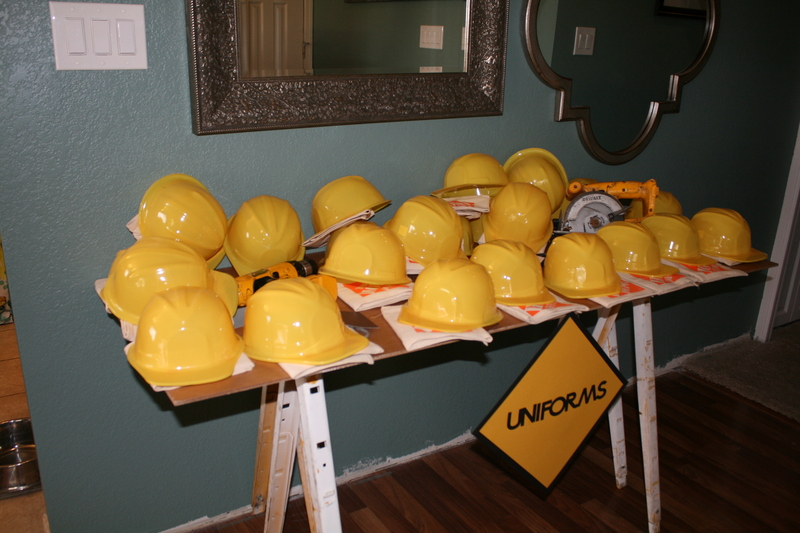 I chose a construction theme because our house was finishing up being remodeled but not complete yet so I thought it would be a cute play on the current state of affairs for our home, but also because my dad is a contractor and he and his crew did our remodel and Poppy LOVED all of the tools and helping my dad. It was really cute, actually, how she always wanted to help use the hammer or screw driver or anything that he would let her have. She was the 4th crew member he never hired. And while I can still pick the theme of their parties, I prefer going with gender-neutral parties because they have both boy & girl friends and because I am just not one to push the typical gender-based things on kids (re: Barbie, pink, princesses, sports, blue, etc.). For this party a lot of the decorations were fairly cheap because I was able to get it for free from Home Depot, already had things in my toolbox (or my dads work-shed! ), or I was able to return to Home Depot afterwards. Maybe that sounds bad, but, my dad is well-known at our local store so they didn't mind! 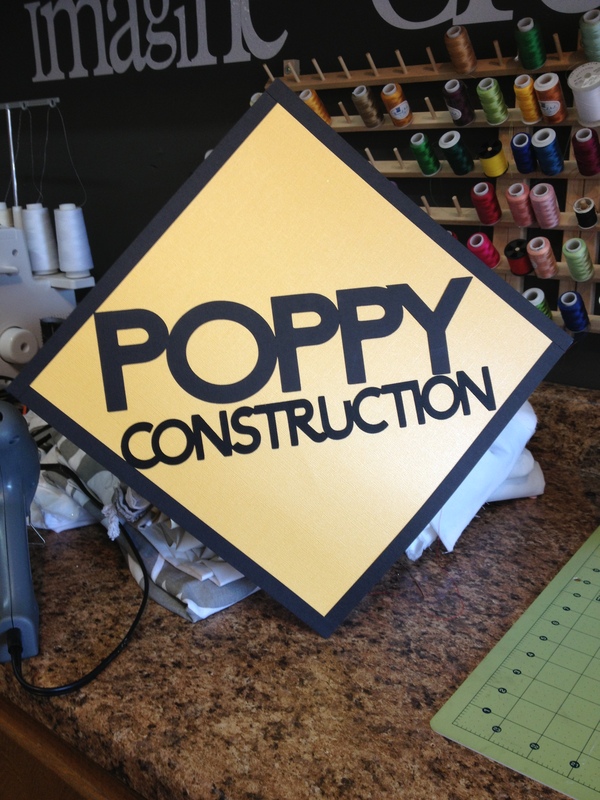 I made all of the signs on my cricut, cut them from black card-stock and then glued them onto shimmery yellow card-stock. 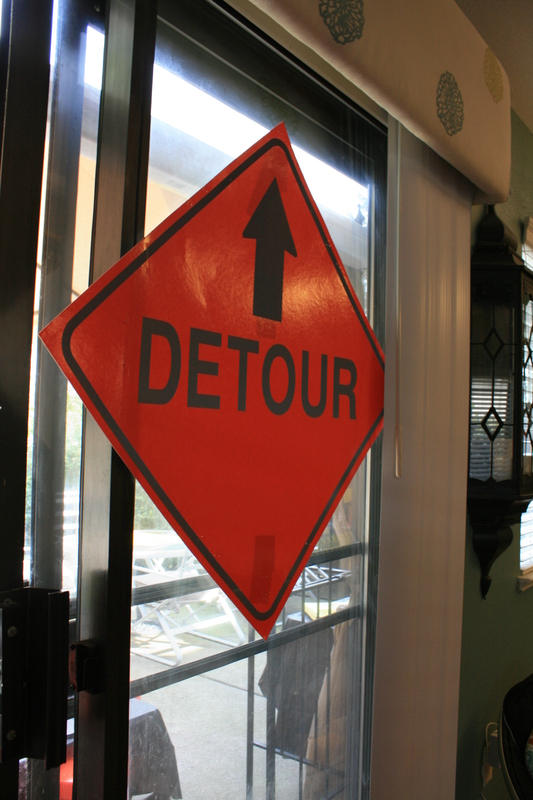 The signs were for decoration but also for labeling/signage for the food. 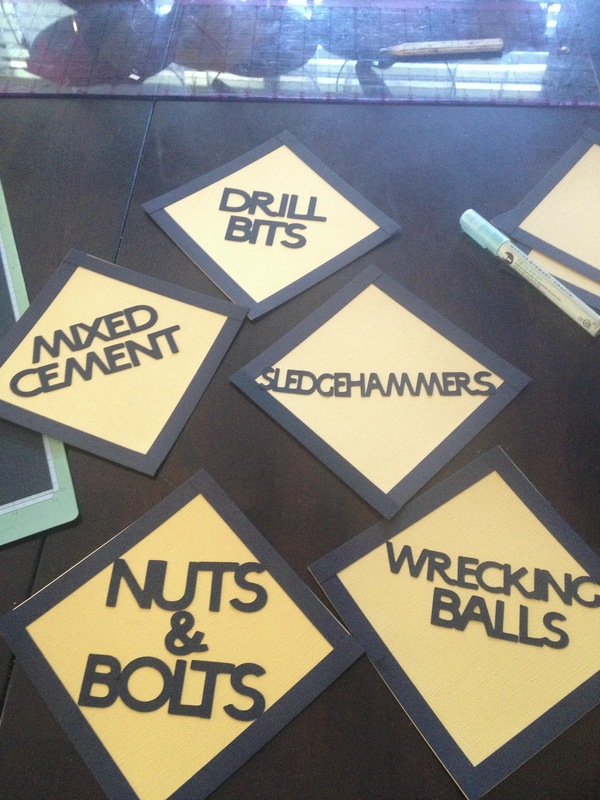 I tried to get creative in the wording describing food and making it construction-related. 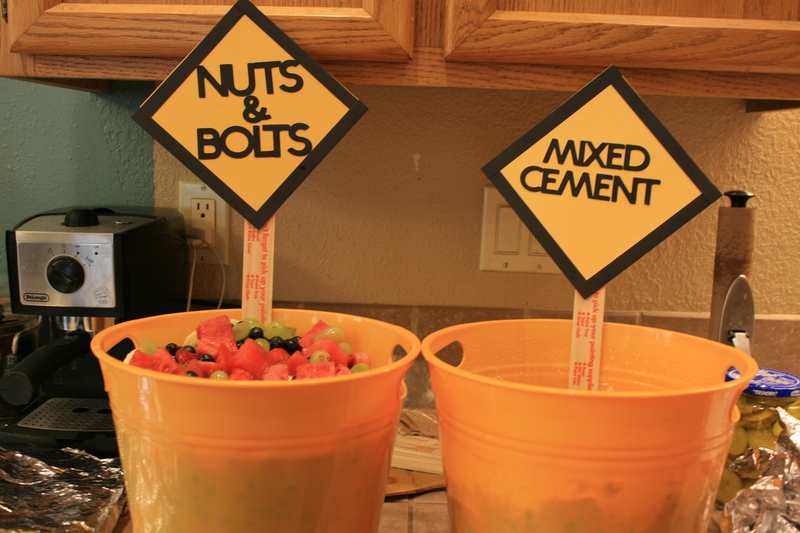 Things like "drill bits" for macaroni & cheese, "mixed cement" for the potato salad (which did NOT taste like mixed cement! 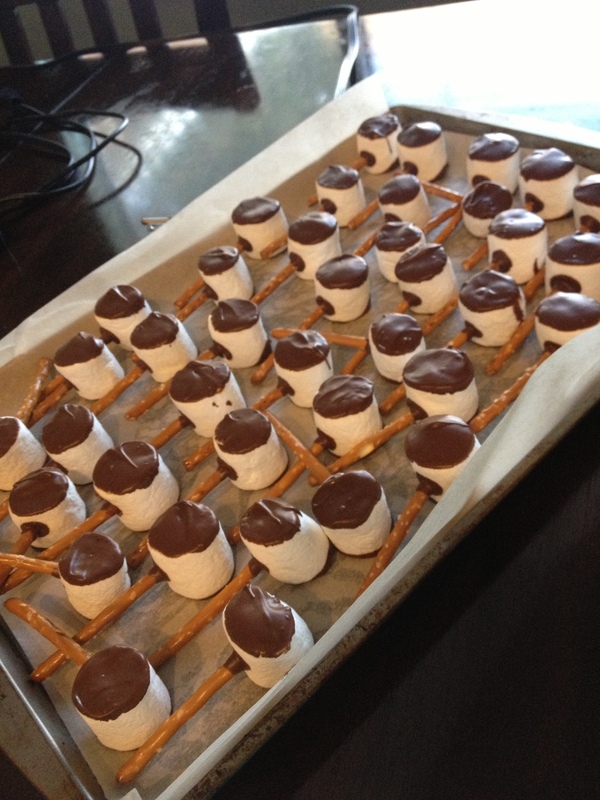 ), "nuts & bolts" for the fruit salad, and desserts were "Sledgehammers" (marshmallows on a pretzel stick), and "Wrecking Balls" which were the chocolate cake-pops. 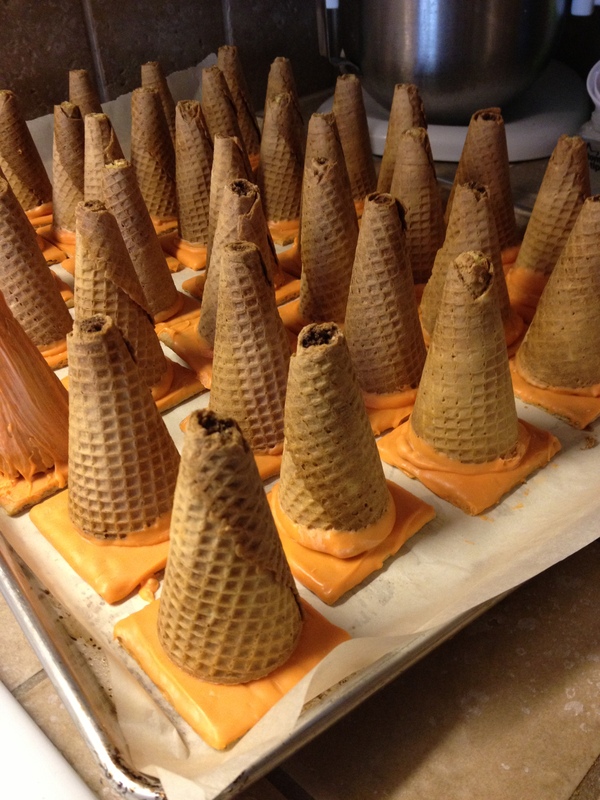 I also did "Cone Zone" which were cupcakes baked into ice cream cones, dipped in orange candy-coating, than stuck to an orange-candy-coated graham cracker to look like construction cones! 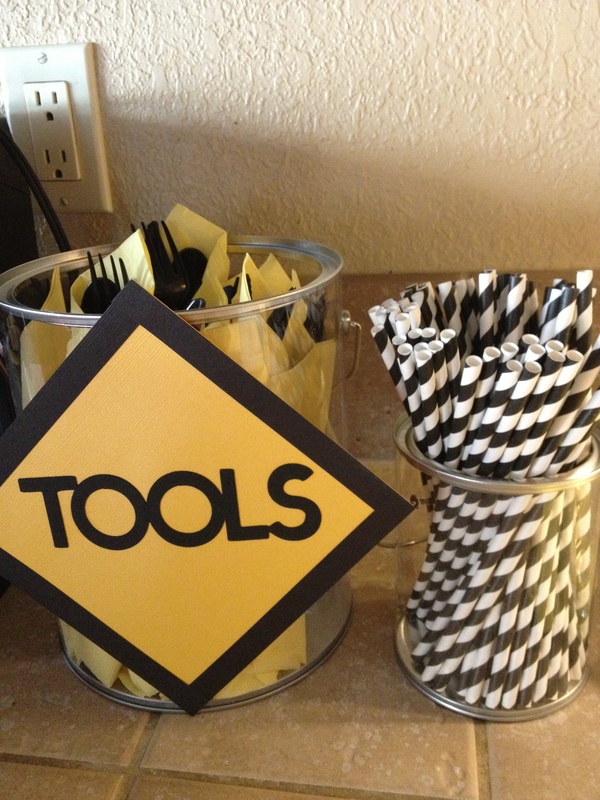 "Tools" labeled the individual sets of utensils, too. 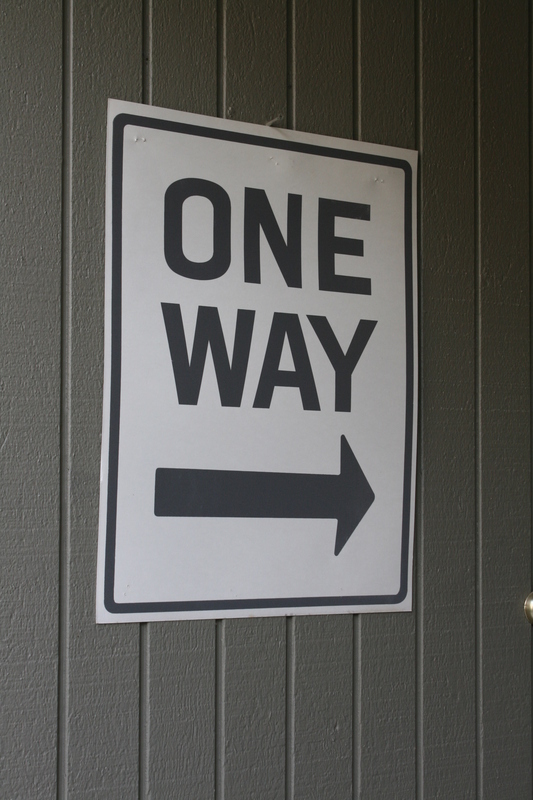 I hung up a bunch of other signs that I made through out the house/yard and I also used real signs that I was able to borrow from the City of Moraga thanks to some connections! I used our kitchen table for the desserts. 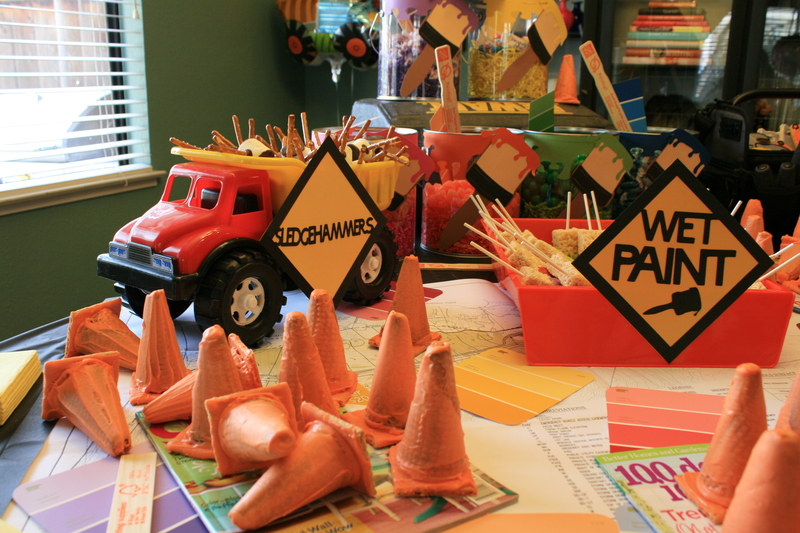 I used things around the house for props/decorations like a canvas tool bag, a saw storage box, and paint trays. My dad loaned me old blue-prints which I used on top of the table over a black plastic table-cloth. 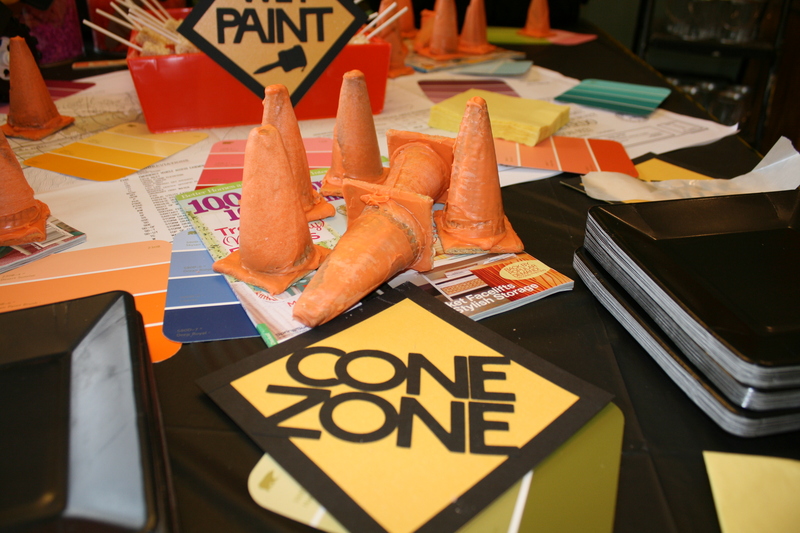 I stocked up on paint chip cards from Home Depot and threw them around the table for color & decor, too. 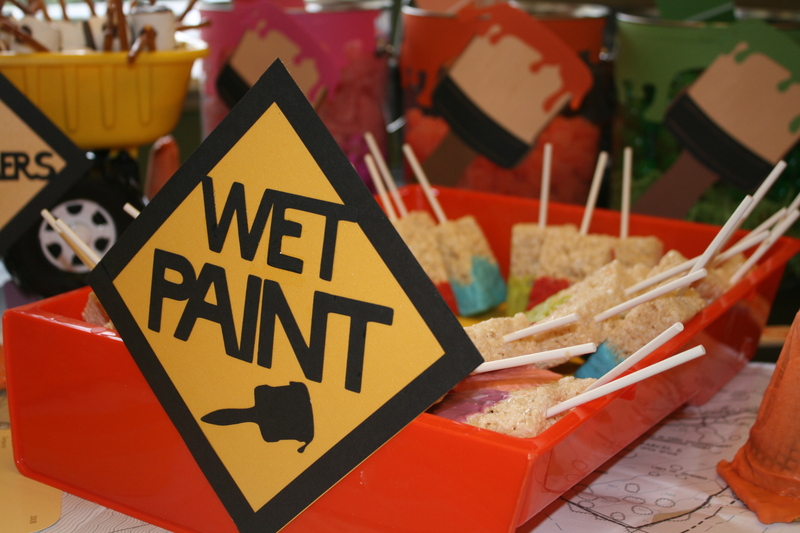 Some of the desserts included "paint brushes" by dipping rice krispies in different colored candy-melts and putting a stick in them and displaying them in a paint tray. 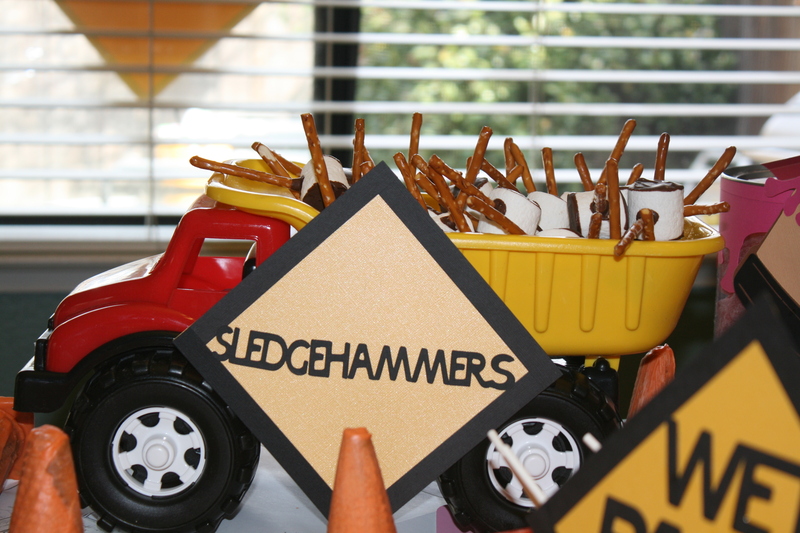 The "sledgehammers" were marshmallows dipped in chocolate with a pretzel stick, piled into the back of a plastic dump truck. 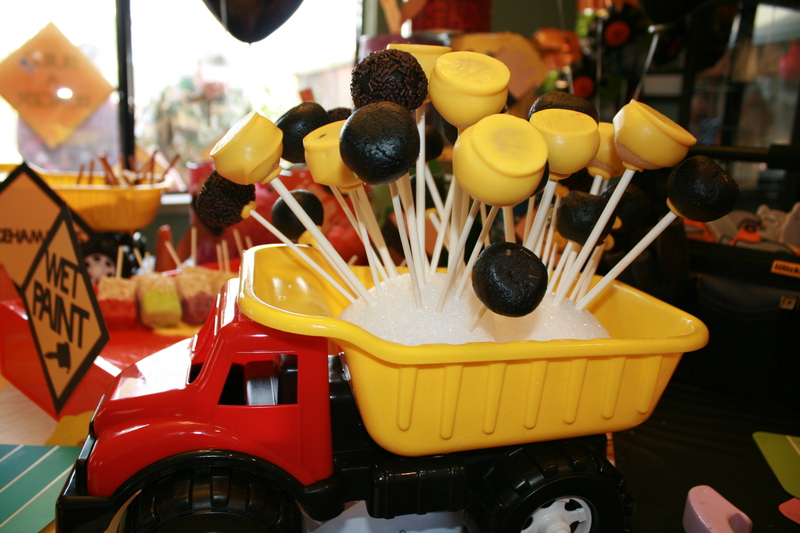 The "wrecking ball" cakepops were poked into Styrofoam and displayed in the back of a dump truck, too. 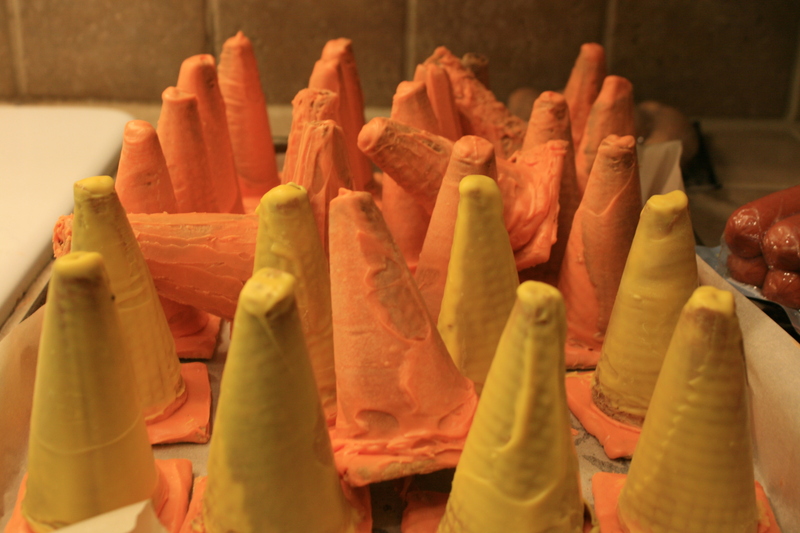 The "construction cones" cupcakes were strewn around the table for effect. 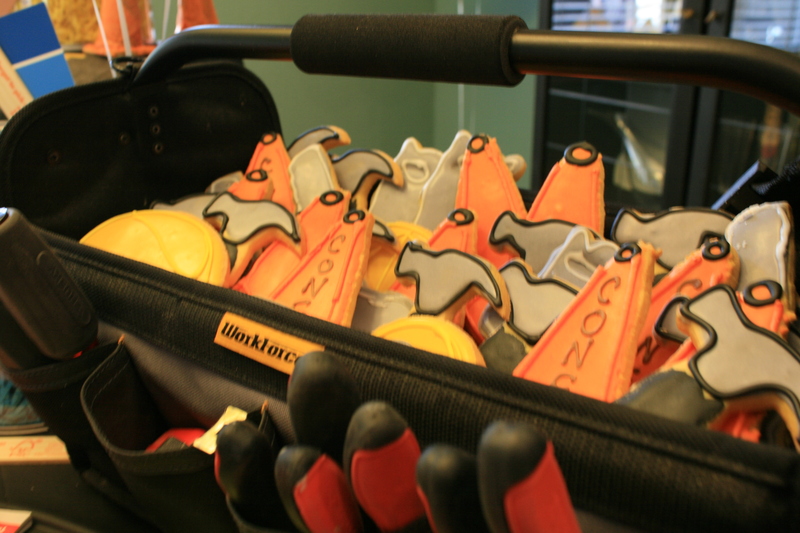 I used the canvas tool bag for the construction themed cookies & had real tools in the pockets for effect. I did a candy buffet, also, and hung a sign that said "Fill Your Bucket". 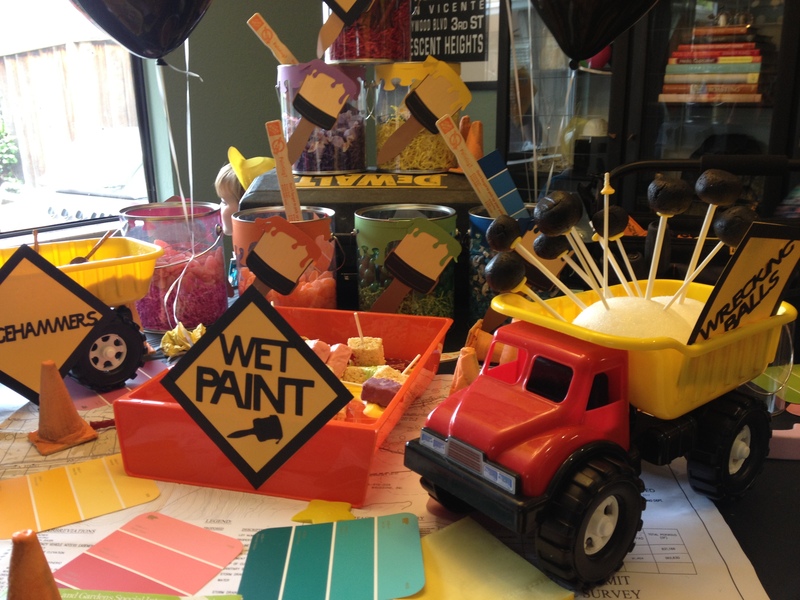 I displayed the big clear plastic paint buckets from Michael's & Jo-Anns with the candy in them. 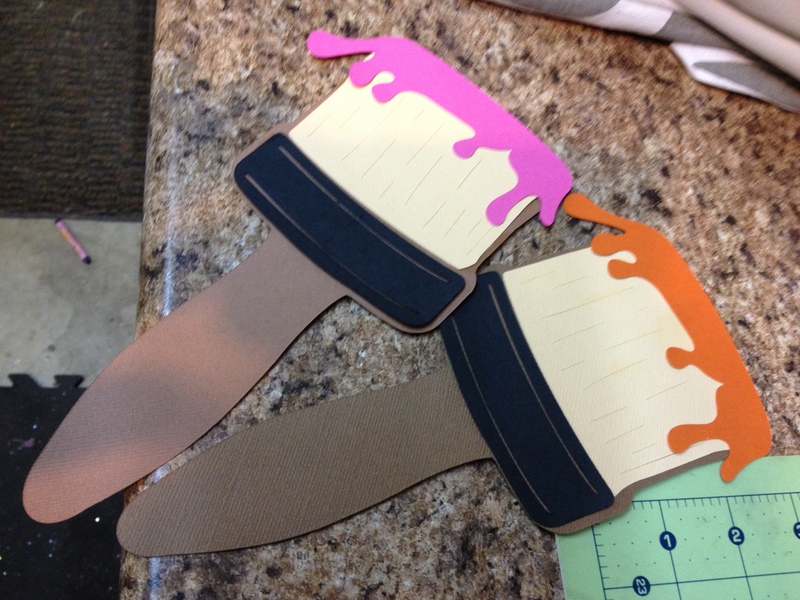 I made paint brushes on my Cricut and made each paint bucket a certain color (red, purple, yellow, pink, orange, green, and blue). 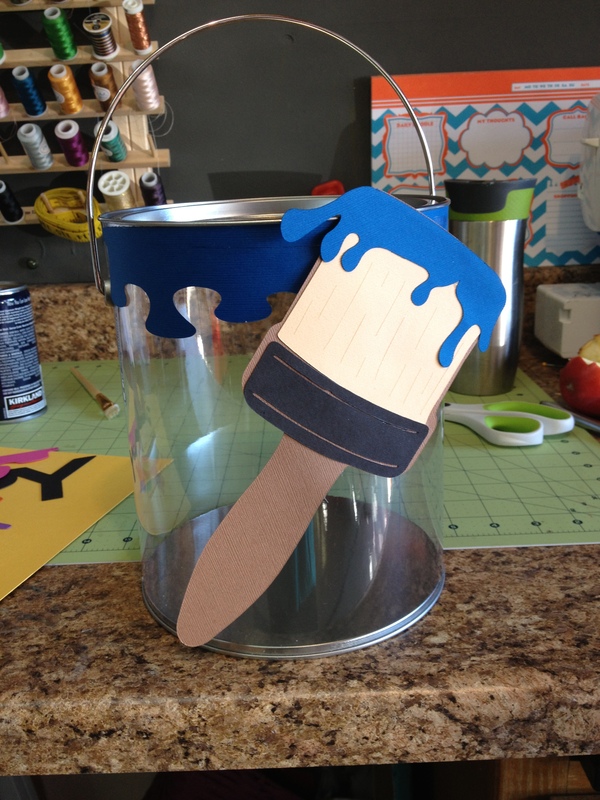 I filled the buckets with the matching color shred & then filled it with the candy. I stacked them on the Diwalt saw case for height and accessibility. The buckets the kids (and adults!) 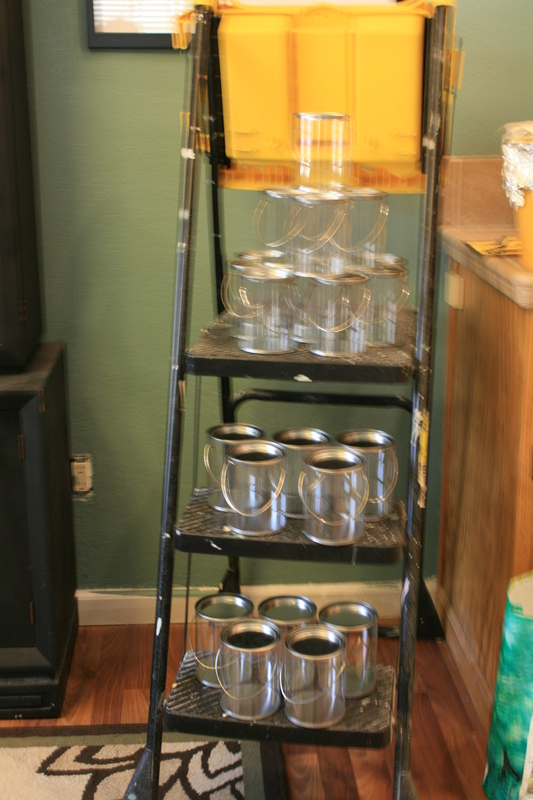 filled were small clear paint buckets which I stacked up on our big ladder and stuck it in the corner. 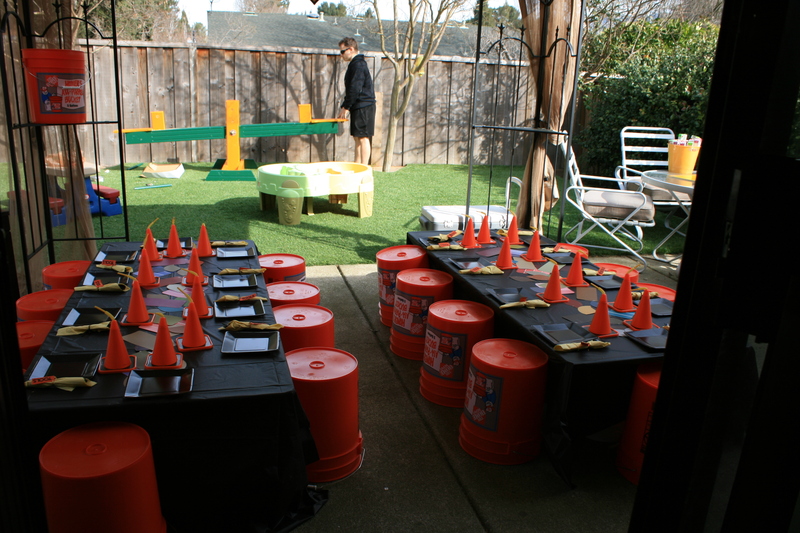 For the seating for lunch I used big (full) paint buckets on the ground with banquet tables (folded) resting on top of them. This was great because they were low for the kids and the perfect height for the Home Depot orange buckets that I used for seats for each of the kids. 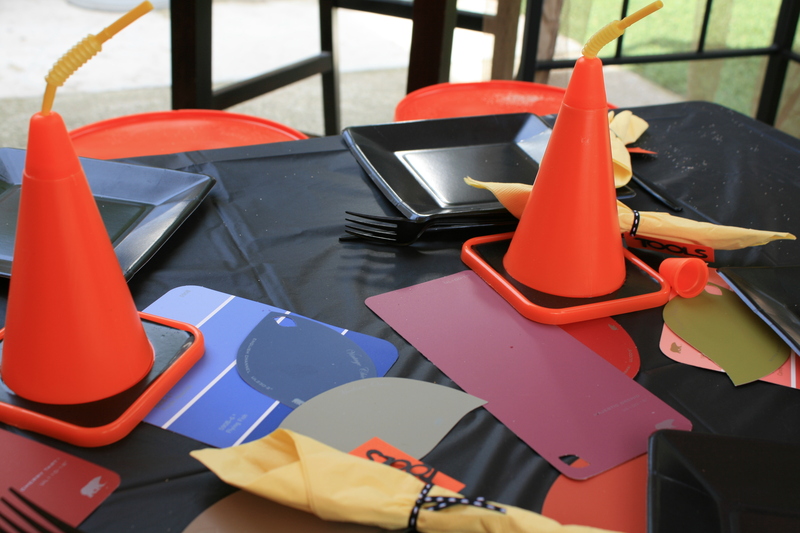 I covered the tables with black plastic table cloths and threw some paint chips on them for color. 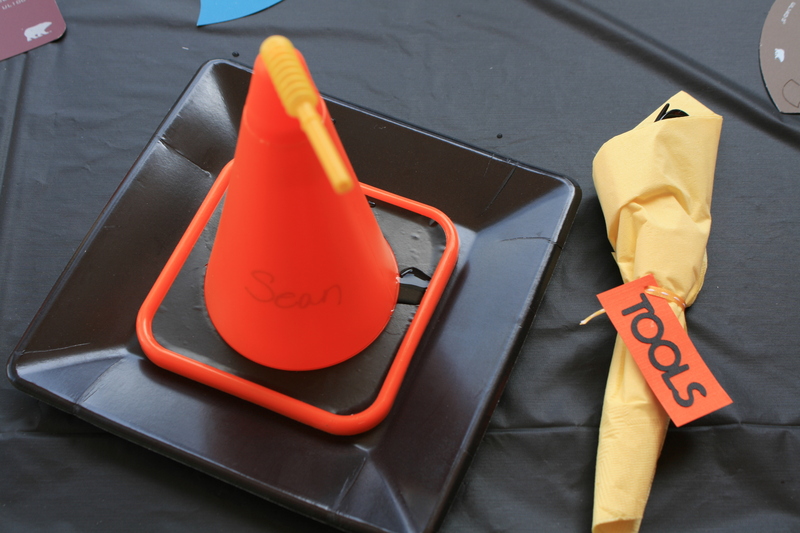 Each child had a place setting and a construction cone cup. 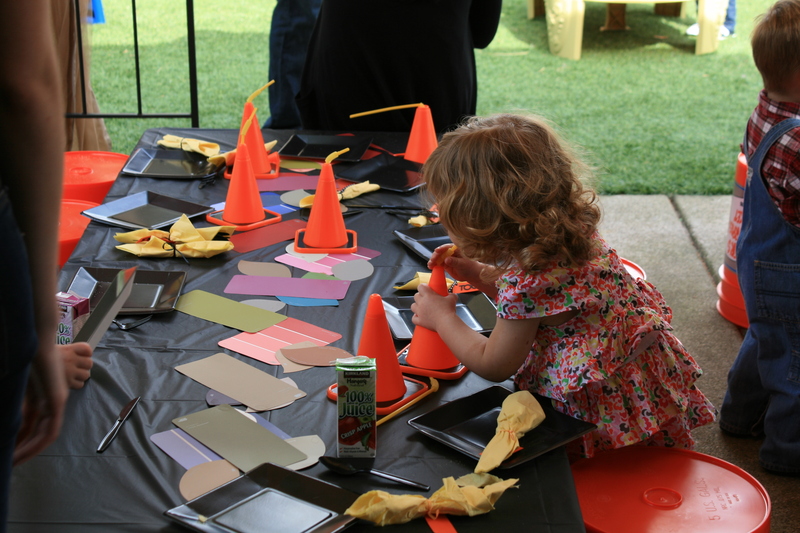 As much fun as I had planning for her party and playing along with the theme, I wanted this party to be fun for the kids but also benefit needy children, also. So, for Poppy's 2nd Birthday there was not a thing that she needed and there was nothing that I wanted her to receive, either. So I decided that in-lieu of gifts, we would request that each guest bring a donation for the Project Night Night Foundation. I am a huge advocate of reading and Poppy just loves her books, blankets, and favorite piggy so this organization was the perfect fit. They provide a book, blanket, and lovie per child for children who are homeless. I requested that each guest brought one or all of the 3 items. We have amazing friends because they all brought donations and most brought multiple donations. The following Monday I proudly took all of the donations to the local drop-off location in San Francisco. 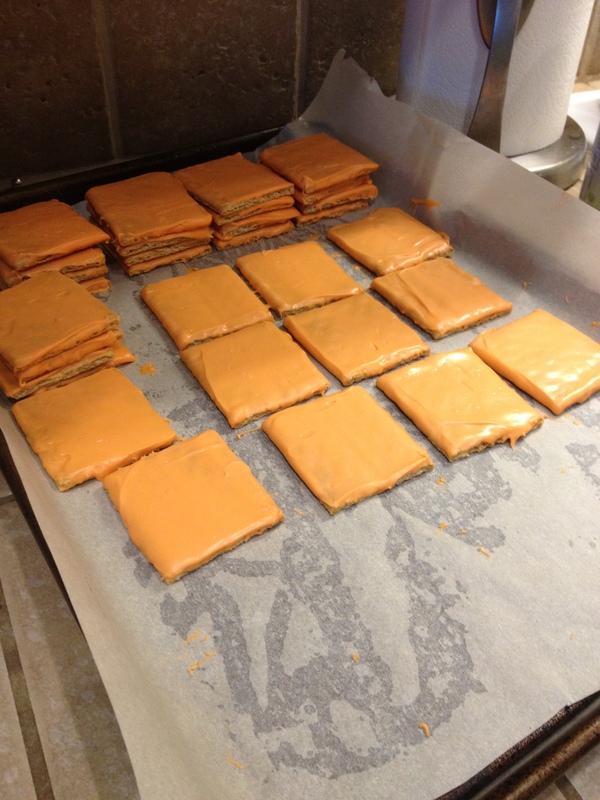 I loved this idea and I will definitely do it for future parties, also. I want my children to enjoy celebrating their birthdays with friends and do it to have fun and not for the presents that they might receive. 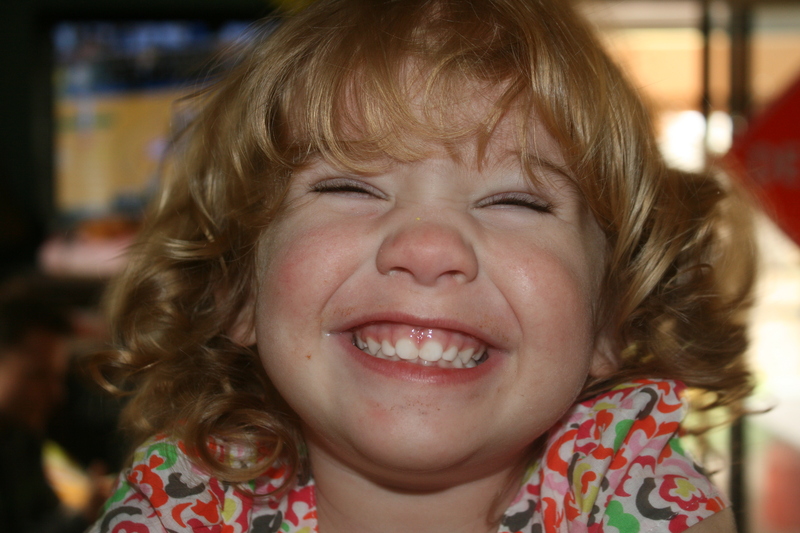 My children are very fortunate that they have all they could need/want right now and they don't need any more 'stuff'. As they get older I will include them in the charity-picking for their parties, but, for the next few ones I will continue to donate to Project Night Night! All in all, the party was a great success. Poppy had a blast, her little friends had fun, and even the adults had a good time! & most importantly, over 30 homeless children received blankets, books, and stuffed animals thanks to our very generous and loving friends and family! Thanks for checking out her party!